Register your partner leads in HubSpot using the lead registration card on a contact record. Click the name of the contact you want to register. In the right panel, locate the Lead Registration section. To register the contact and their website domain as a lead, enter their information in the required fields and click Request registration. All known field data will be auto-populated by HubSpot. If the status shows Registered, the lead is successfully registered. 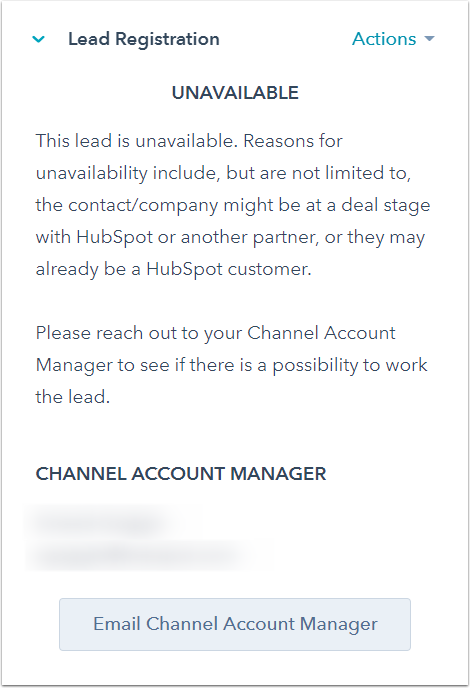 If the status shows Unavailable, click Email Channel Account Manager to email your Channel Account Manager for more information. Learn about how to comply with GDPR for partner lead registration.